For those new to the fish finder domain, the vibrant color gradients of traditional SONAR might be a tad difficult to understand. The Lowrance Hook 3x DSI fishfinder reviewed here is a down imaging-only unit. We found the price-point and quality worth reviewing. We were introduced to DownScan which does a much better job of distinguishing structure. The Lowrance Hook 3x DSI is a fish finder with 3D scan only. It does not have the traditional 2D SONAR scan. Instead, it has the down imaging technology which shows the underwater structure in more detail. This is a great unit for freshwater fishing in areas which is rich in fish population. The display and interface are user-friendly and offer great value for the price. More importantly, it fits into a small budget too. It is best suited for kayaks or small boats. - Traditional SONAR vs Down Imaging? 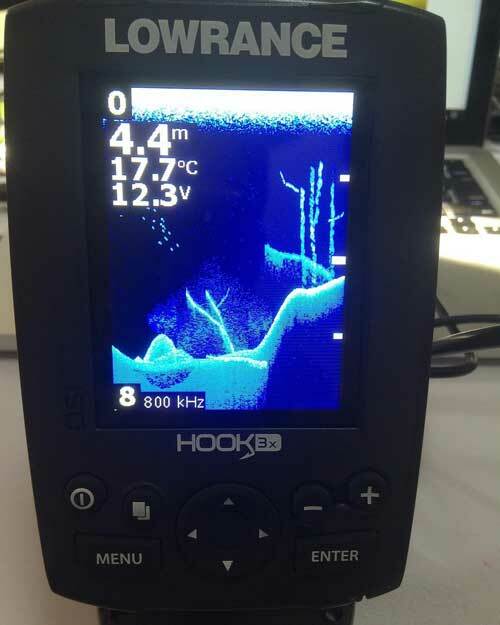 The Hook 3x DSI fish finder is portable and petite for the screen size. The better part of the face is covered by a screen on top. There are button controls below the screen. The body is tough and up for some rough use. But Lowrance always makes their fish finders that way. It is IPX7-rated waterproof. This means it can remain under up to 1m water for up to 30 mins. The display of this Lowrance fish finder measures 3.5 inches diagonally. This is the size-sweet spot for compact fish finders. The screen is a 256-color TFT screen element which can display colors vividly. The screen resolution runs 320x240 which is sufficiently high for the screen size. It is easily visible from any angle. It is supported by LED backlights that can be set through 11 different levels. The backlight can be operated via the power button. The buttons of the Lowrance Hook 3x DSI fish finder are pretty intuitive. They have a multi-directional pad under the screens. These are flanked by Zoom buttons on one side and power and Pages button on the other side. There are Menu and Enter buttons below these. The Pages button can be used to toggle between the two frequency choices for down imaging. The Hook 3x DSI fish finder offers up to 4x zoom. This can be easily adjusted using the Zoom plus and minus buttons. This Lowrance fish finder packs a Quick Release Bracket. You can simply pull the top tab up to release the unit from the mount. You can angle the screen any which way and also tilt or swivel the unit on the mount. The screen stays visible through all viewing angles. The Lowrance Hook 3x DSI fish finder packs a DSI Skimmer transducer. This transducer is part of the 000-12636-001 model. It comes with a transom mount. This is capable of down imaging at two different frequencies but not simultaneously. It comes with a 20-feet long cable. The Hook 3x DSI offers only 3D scanning with down imaging. You can select between two frequencies for scanning: 455kHz and 800kHz. The scanning beam of 455kHz is wider and covers more area horizontally and vertically. But it offers fewer details than the 800 kHz beam which is more focused. The 800 kHz beam is best used in shallow water to get better clarity than the 455 kHz beam. You can use the Pages button to easily switch between frequencies. The down imaging itself looks very pleasing compared to the brash colors of the traditional SONAR. It has a single-tone display that helps you identify the objects that would otherwise look like blobs of color. 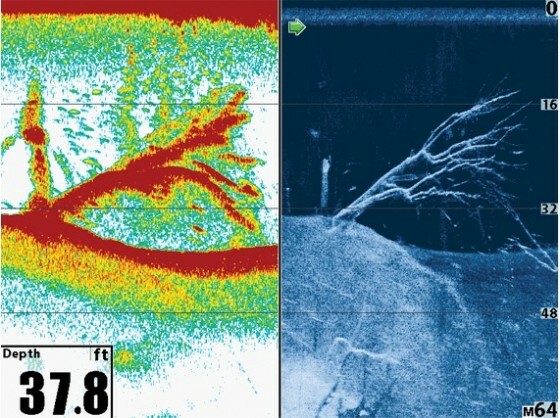 For a novice angler, downscan imaging is much easier to comprehend than the traditional SONAR. Do note that the 2D SONAR shows fishes as arches while the down imaging shows them as little dots. It might get a little difficult to differentiate single fishes from SONAR irregularities in down imaging. But if there are schools of fishes or multiple items clubbed together, DownScan offers a more resolved image. Check out the difference between traditional and DownScan images below. Notice how the branches of this plant look random in the traditional SONAR but the image is much clearer in the DownScan. Down-imaging fish finders also offer better range vertically than side-imaging units. They send a beam directly under the boat for better clarity of the structure. Down Imaging also works better than side-imaging at higher vessel speeds because the latter scans horizontally. With down imaging, the Hook 3x DSI fish finder can range from a maximum depth of 300 feet. And its best used in freshwater. You can also use it in shallow saltwater bodies. You can use it at vessel speeds up to 55 mph. But for best performance, the speed should be between 1-6 mph. The Lowrance Hook 3x DSI fish finder does not have many extras. It does have a temperature sensor which can give you temperature readings at high speeds too. You can also measure the depth of the water with this device. The Lowrance Hook 3X DSI is a fairly straight-forward device. Here are a few tips to get the most out of it. 1. The optimal boat speed for using the down-imaging function of this fish finder is 1-6 mph. 2. Press the Pages button with two sheet symbols to switch between the frequencies. The 455 kHz beam has more penetration. 3. Down Scan only shows what’s under your boat, you will have to judge which side of the vessel the structure is on. 4. Zoom into the view using the Zoom buttons for a better idea of the clump you may be seeing at the screen. The Lowrance Hook 3x DSI is down-imaging fish finder that provides a clear and detailed structure scan. Those who want almost photographic SONAR images will find this imaging quite useful. It’s a durable unit which is intuitive to operate. The price is quite attractive too. The temperature sensor is a nice addition if you want to check the temperature of the water surface. The transducer is of high quality. 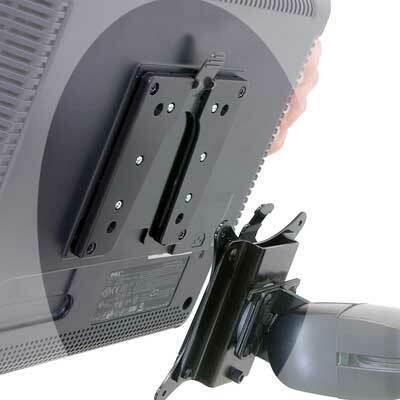 The Quick Release Bracket mount allows easy portability when required.